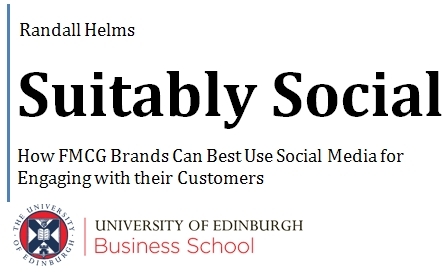 I am very proud to present to you my MBA dissertation for the University of Edinburgh Business School, Suitably Social: How FCMG Brands Can Best Use Social for Engaging with their Customers. This report draws on a range of primary and secondary research, including eighteen interviews conducted in person, over the phone, and via email with a number of professionals from FMCG brands, consultancies, and digital marketing agencies. It is the fruit of several months work, and I am very proud of the final result! Finally, I hope that you find it interesting and useful, whether you work for an FMCG brand, in social media, in marketing more generally, or even if you are just interested in the topic. To download the full dissertation, please click on the image above. Social networking is a genuine cultural phenomenon, having become the UK’s most popular online sector in less than ten years. As social media consumes ever greater amounts of leisure time, how to use this new channel effectively has become perhaps the most important question facing the marketing profession. Although social media presents challenges to all sectors, this report looks at how marketers of Fast Moving Consumer Goods (FMCG) brands can best use social media to engage with their core customers. In answering this question, this report draws on the results of a program of primary and secondary research, including eighteen interviews conducted in July and August 2010 with professionals from a number of FMCG brands and digital and social media marketing agencies. Among the topics covered in these interviews were identifying core customers, customer engagement, defining and measuring ‘success’ in social media, using social media for market research, working with influencers, tracking the online conversation about a brand, what specific challenges FMCG brand managers face in the social space, as well as social media’s downsides for marketers. The research showed that it is impossible for FMCG brands to segment their social media audience in order to identify their core customers. Instead, it was revealed that social media is an effective tool for engaging with a brand’s existing customers, whether ‘core’ or not, and that there are a number of best practice principles that can be utilised to help achieve a brand’s goals in the social space. Although a number of interviewees claimed that brands should only be involved in social media if they are willing to commit the proper resources, the fact that none said that their brand was better off outside the social space shows that a social media presence is no longer optional, but is instead essential to the work of the modern marketer, even for FMCG brands which, as the research showed, have not been on the cutting edge of the social media phenomenon. Social media is more than just a marketing channel because it offers marketers a direct, unmediated connection with their customer, and this relationship can be leveraged for insights relevant to new product development and market research. This is particularly important to FMCG marketers, because social media offers them direct access to their products’ end users for the first time. This engagement can provide a better understanding both of the customer as well as what they want from the brand. The research also uncovered a number of problems with social media, such as the difficulty of defining Return on Investment and the fact that social media can be extremely time-consuming. Furthermore, many FMCG brands face the additional hurdle of having relatively uncommitted customers due to their lack of brand resonance. Note: All work in this report is the copyright (2010) of Randall Helms. This report has been made available under a Creative Commons Attribution-NoDerivs 3.0 Unported License. For more details of the licence, please visit http://creativecommons.org/licenses/by-nd/3.0/. Thanks very much for your kind words and for featuring the dissertation on your blog! I’m producing a website for FLNA (Frito Lay North America) for Doritos brand: http://www.doritoslatenight.com and before that delivered digital work for various FMCG groups from P+G to Felix Cat Food… it’s been really fascinating from a production perspective looking at how social media has impacted on what I’m being commissioned to produce… and also asks the question – where next for digital content? one of the key things I’m being asked to implement is increasingly complex integrated social media across global networks – e.g. Wretch in Taiwan… Anyway got to run to work but just wanted to say HUGE CONGRATULATIONS on your first and your MBA – good on you! Thanks for stopping by and leaving a comment. I’ve just had a look at the Doritos Late Night sight and am very very impressed! Very nicely done. Out of curiosity, do you find that having to include social media elements in your web work makes what you do much more complicated, or has it been fairly painless integrating it into sites like Doritos Late Night? Well written and a good deal of meaningful insight too. Thanks very much Alex – I’m glad you enjoyed it and found it insightful.